I saw it on Craigslist about a week ago and was instantly and desperately smitten. The desperation part was what had me trekking out in the snow to pick it up. I knew it wouldn't last long, and I wanted to be sure I didn't miss out on it. I always love when the pieces I acquire come with a story or some history. I live in Oregon's capital city, and so we have lots of government agencies here. 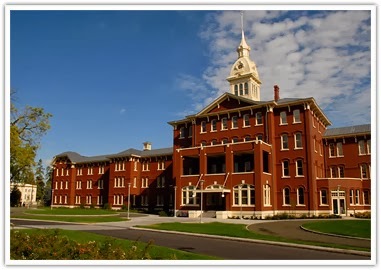 One that I have driven past for years is the Oregon State Hospital. 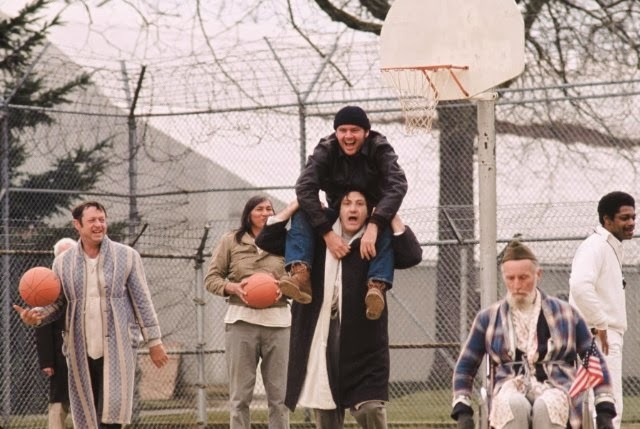 It was made famous in the 1975 movie, "One Flew Over the Cuckoo's Nest" starring Jack Nicholson. They filmed a lot of the scenes here in Salem, West Salem, (where I live!) and the coast. I've never actually seen the movie in it's entirety - I was 3 when it came out. It was on TV recently , and I caught some of it. It was unreal to see so many familiar landmarks!! Anyway, the hospital in recent years was looking down right scary. So decrepit and falling apart. I always felt bad for the families who had loved ones here because it would truly be so depressing coming to the building. It has a long and shameful past. If you want to Google the hospital, you can, but trust me, it's past is depressing. About 7 years ago it underwent a major renovation, and the building looks beautiful now. New paint, new additions, and the architecture of the building is better highlighted. More importantly, I hope that the patients there are receiving better care thanks to some of the conditions that came to light during it's reno. During the renovations, there were a lot of things that were taken out by former employees and this dresser was one of them. Simmons - the same company that makes mattresses, was also in the furniture business until the Great Depression, and then they gave up that branch during economic hardship. 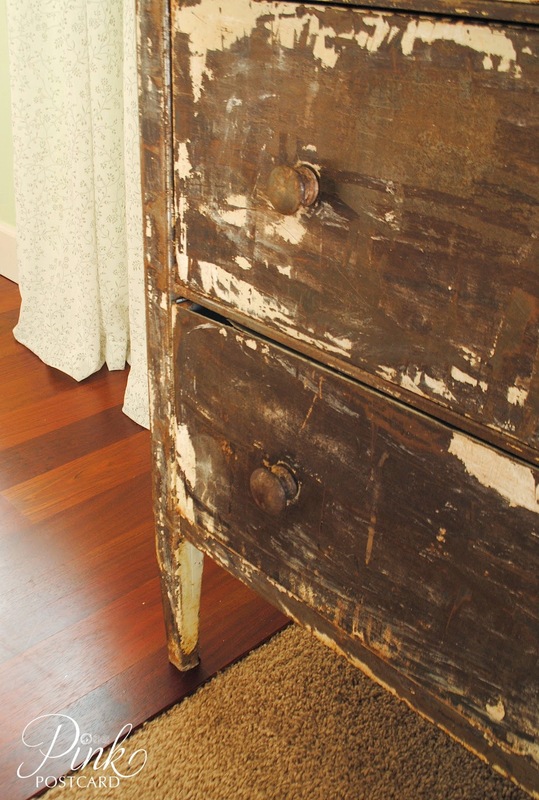 Simmons steel dressers were used in hospitals and the hotel industry. You can see restored or mint condition pieces online. This one made my heart go pitter patter though. 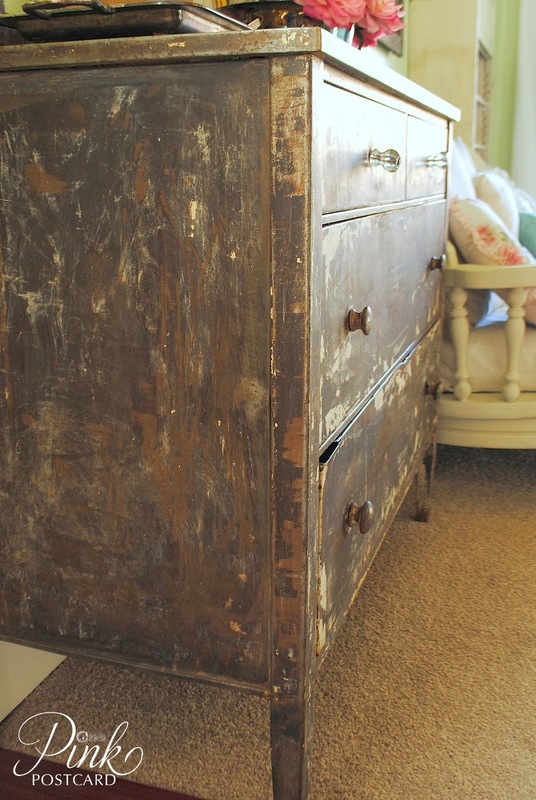 I love the scraped off and chipped white paint. 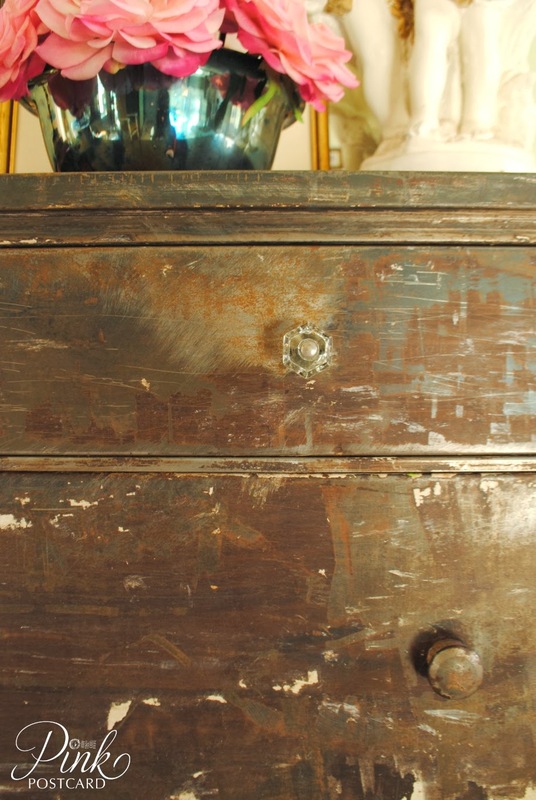 The knobs were also steel, but two glass knobs were added by a previous owner to the two top drawers, which I also find charming. I still have one spare metal knob if I ever decide to replace and have all matching. This replaces a small wood bookcase we've had since our very first apartment, on loan from Jon's mom. We're going to turn it back over to her, and enjoy our new industrial piece of local history. Even though the history behind the site that this came from isn't wonderful, I hope we can give it new love and life. I gave it a good cleaning but that's about it. I plan to add in some drawer liners and oil the glides so the drawers will run smoother. I'm enjoying adding pieces to our home that are unique and have an interesting history! I'm looking forward to fluffing our nest more this year, and rounding out a lot of our decor. What a COOL piece! I've never seen anything like it. Thanks for the history, too. :) I love it for all the same reasons you love it. Very unique piece, I love where you have it and the vignette on top of it! Yes, thank you for sharing it's history too. Amazing about the hospital where the movie "One Flew Over The Cukoo's Nest" was filmed! Thanks for sharing. I also came because of your picture holding the cute pug. We had a beloved pug just like yours for almost 13 years and he died 3 years ago and I still miss my Ben soo much! I just sent you my comment. Did you recieve it? Please let me know! Wow. This is amazing and I love that you kept it in it's original state! I haven't driven past that hospital in years--I would brave the snow to get that dresser too! I love the story--though it does creep me out a wee bit. Love it though! What an amazing find! I can't believe that you had to do nothing to it. What a great piece to find. Very unique and with a interesting history. 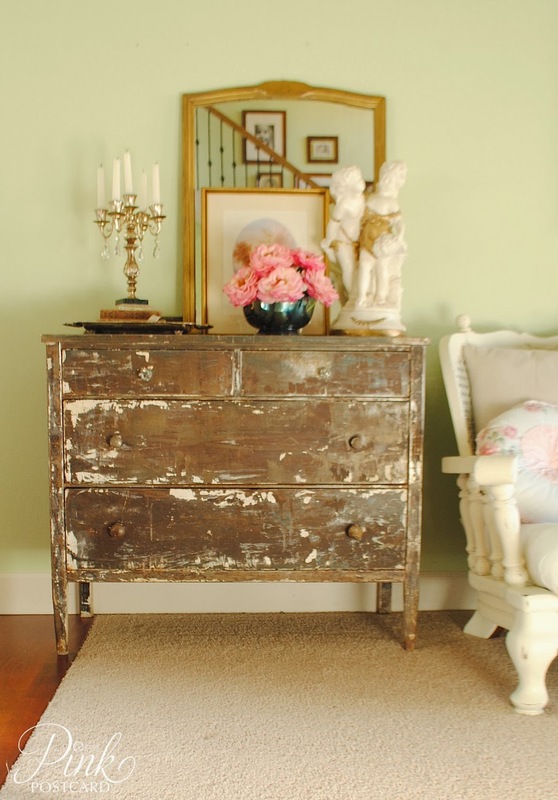 Love the vignette you create it to display it. Hi Denise, love your chest. Just saw your charming living room from Kim's. It's beautiful. So glad to discover your blog. I'm a new follower. Wow! What an amazing find. I love rusty steel anything! 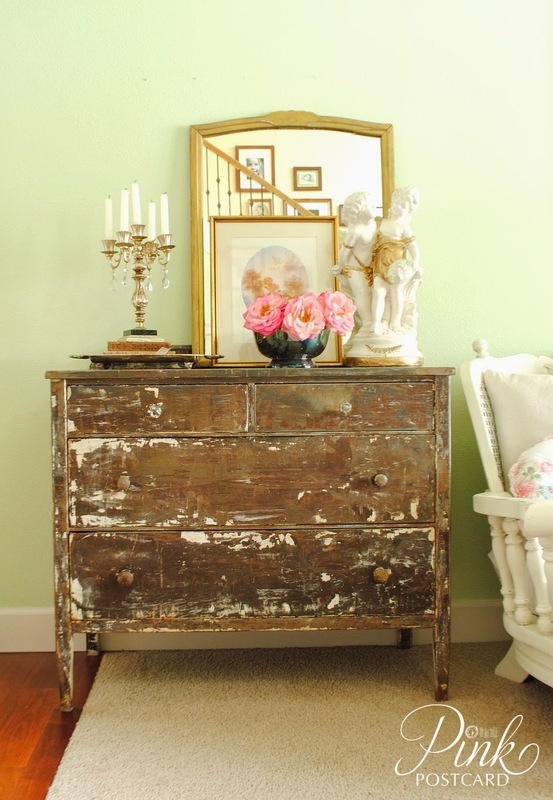 Wow, Denise....I thought this dresser was made of wood! I never would've thought it was metal. :) It's so neat that it's got a history right from your home town. Makes it all the more special! Really a cool piece!!!! That is an awesome piece Denise! Thanx for partying at my place. What an amazing old piece! Salem is my hubby's birthplace, and he still has some family there. We lived in Tualatin for about ten years, and we were there when "One Flew Over the Cuckoo's Nest" came out. I remember how creepy it felt to drive past the hospital, especially after seeing the movie. I'm so glad it has been renovated.